In any event, it is a lovely display. Jorge Borges wrote a powerful and wonderful short story called The Library of Babel, where the universe is basically composed of books the center of which is an anti-black-book-hole. I was thinking about this in a waiting room a few hours ago, and thinking of the Infinite in general, all of which somehow led me to the Finite Library and Forgetting. In a country set into thin mists, compulsive and repetitive feeding instruments were replaced with Ideaoterias. Rather than an endless maps of interwoven McDonald's restaurants set at predictable intervals, there are libraries. Each library contains 10,000 books. All 10,000 books are the same from library to library. Each location must organize their 10,000 volumes differently, each grouping identifying ideas inherent in the contents of each volume, in support or negation of one another, arranged with other books that were complimentary, or supplementary, or antagonistic, or worse, or better. 4. The organization of thought contained in those 10,000 volumes would be different from location to location, the librarian-explorers having organized the library so that the books were freed into new spaces. 5. The number of books is finite; the infinite aspect is the continuous shifting of material and the expanding structure for the display of ideas. The simplest aspect of this arrangement makes it possible for every book to actually be seen. (Even in cursory browsing the mind has certain expectations of what-come-next when browsing a shelf, sweeping past things that have been swept-past before, rejected or unneeded for whatever reason. The deeper aspect is for the association of ideas by the placement of book, the arrangements suggesting themselves for the reader to have a new experience witn an old idea or book or set of books. 6. The McBorges' Library is a learning, memory, and forgetting experience. 7. Forgetting may be a key to making these libraries an infinite experience: re-re-re-etc.-learning does not imply necessarily that the learned bits will be cumulative, and useful. Maybe the best we can do is have learned and re-learned bits in a new context, making it possible to have more ideas; this means that a certain amount of forgetting is necessary, where that forgetting unleashes existing associations of ideas. 8. At McBorges', forgetting is an important aspect of learning, but really only in regard to what it would take to open the possibilities for new ideas by rearrangement of old relationships. The palaces of memory work hand-in-hand with the Palaces of Forgetting. "Motion-picture and method of producing the same." I've written a note earlier on this blog about the history of word balloons--it is the stuff that we think of today as the little clouds filled with words over the heads of comic book characters and such, but which had a long history stretching back at least to the Renaissance when speech was illustrated in a similar way, but with lovely scrolls instead of blank clouds (as we see above). The following illustrations though come at a great expense to the imagination, and were a weak but fully patented attempt to replace spoken-word captions in the pre-audio motion picture--that is silent films before the Talkies. In general I guess the complaint with illustrating speech during a photoplay was that the text card was a breakaway from the moving-picture part of the experience, necessitating a clean break from action so that the audience could read about what was being pantomimed. Folks were well underway in processes to produce sound motion pictures, though up to this point--1917--the systems were separate recordings of sound and speech which would be played in conjunction/synchronously though not necessarily at exactly the right moments with the motion picture. Edison was hot on this trail but with blemished trials, combining his kinetoscope and phonograph in very early and novel attempts at producing a sound motion picture in the first decade or so in the development of moving pictures. The next 20 years in this development are fairly complex, but the matter is fairly well solved by at least three different technologies by 1923 with the production of successful continuous sound-on-film motion pictures, and then most famously and successfully debuting with The Jazz Singer in 1927. And then there is this colossal bit of overdeveloped-underdeveloped thinking that would link the seamless word of not needing text card interruptions with non-spoken speech--and coming just this shy of not meaning anything at all. The work is that of Charles F(elton) Pidgin (1844-1923) who was a very successful author of genre/historical romance books (though he did have an interesting-sounding title in The Letter H, a Novel). He was also an engineer of some sort with some advanced patents in calculating machines and devices, which is the way I came to his name (via a letter I have written to him by the director of the U.S. Census rejecting his tabulating apparatus because it basically produced too much info for too much money, but that's another story). Pigdin's idea--in short--was to have an inflating paper text bubble issue from the mouth of the actor during a scene--in that way the view could see what the other actors on the screen were "hearing". I know this might sound as though I'm judging a technological effort from the vantage point of the idea's deep future, but I believe that this idea was a truly bad one right from the moment of conception, a two-beer idea that should've stayed in the bar, no matter if it was 1917 or 1967 or 2017. Sometimes bad ideas are just bad ideas, top to bottom--and some of them are timesless, like this one. This rather strange example was printed as the covers of a pamphlet in 1928 and comes from the American Foundation for the Blind, simply showing the progression of the agency's representatives extending out beyond the originating point of New York City, though on first sight the map is very unusual, and naively odd. Again, they are very unusual images--particularly the latter--and they were trying to be so. The Unexpected Unusual map is unusual but not by choice. Another example is the cover illustration for A Brides Guide to the U.S.A., which was intended for the (British) brides of American servicemen returning to the U.S. following the end of WWII. More than anything, the whole arrangement of the pamphlet is just a little off. And lastly, for now, comes a puzzling map from an oddly-named pamphlet called Conservation (More or Less Humor) which was an appreciation of some of C.C.C. camps (Civilian Conservation Corps) and shows little sign of authorship ("S. Martin") and none of place of publication. The whole production is pretty happenstance, somewhat crude, and probably quickly undertaken and completed, giving it an air of slim and slippery mystery. 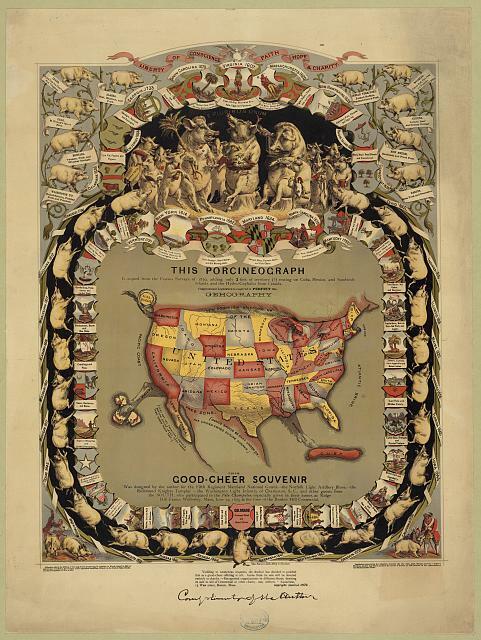 The end result for the pamphlet cover, though is unusual, and a little creepy, somehow, and in a way it is a great representative of the Unexpected/Unusual/Unintentional in maps. If you defined the internet as a transporting device for vast amounts of information and data then perhaps Abdul Kassem Ismael (938-995), the Grand Vizier of Persia, produced such a thing over one thousand years ago. I found the story in Albert Manguel's A History of Reading (a fabulous book published in 1996), who relates that when the Vizier traveled he did so with his library. That was an enormous effort, as ther were 117,000 volumes in the library, all of which were packed up onto 400 camels, and sent on their way. That camel train--which I imagine must've been 1.5 miles long--was piloted by 400 drivers, and then attended to by an entirely different camel train of support of food and water for the perhaps other 400 people traveling in support, making the whole enterprise 2 miles long or more. The books were all arranged alphabetically, so the drovers maneuvered their camels in a certain way, making them mobile librarians in their way. In any event, the whole movement of that vast library 1000 years ago can romantically be seen as a sort of internet--for one man. It seems that this is a mostly not-true story/interpretation of a near-event, but I'm running with the interpretation. The Simon was a five-hole paper tape (which was its data entry and memory) 2-bit storage relay-based computer that could use numbers from 0 to 3. It was extremely limited, but it worked, and it was real. And affordable. And a baseline for things to come. First: "Simon itself can grow. It possess all the essentials of a mechanical brain..."
Third: "It may stimulate thought and discussion on the philosophical and social implications of machines that handle information..."
"Some day we may even have small computers in our homes, drawing their energy from electric-power lines like refrigerators or radios ... They may recall facts for us that we would have trouble remembering. They may calculate accounts and income taxes. Schoolboys with homework may seek their help. They may even run through and list combinations of possibilities that we need to consider in making important decisions. We may find the future full of mechanical brains working about us." I found this unusual report in the Library of Congress Pamphlet Collection stash here in the warehouse--surprised that it was printed, and surprised that it was printed in Paris in January 1945. Paris had been liberated by this time, but I wasn't so sure how much of this sort of technical data would have been liberated during the last stage of the war. Of course the Germans were past the V1 with the V2, but, still, I thought it the data was unusual to find reprinted in a technical journal (Genie Civil, 1 Januar 1945). [Moreau, Henri (1893-1978) and Paul Chovin. "L'arme allemande de represailles V1", offprint from Genie Civil, 1 January 1945. 9x6 inches, 8pp, printed in Paris (newly liberated from the German army 25 August 1944) in early 1945.] And for some reason there are no reprints of this available in libraries worldwide, or so says the OCLC/WorldCat catalog. I've reprinted the document below in its entirety. Some of the text runs off the side of the scanner, but that is the best I can do in scanning the pamphlet without taking it completely apart. JF Ptak Science Books Post 1670 from December 2011, revised. In the history of dropping things--as distinguished from simple falling things--it must be said I think that this is the easiest of all human activities ever invented, and people have been trying to improve on this creation ever since. After all, almost anyone can do it and--if you include pushing things over a ledge so that they might fall--most complex life forms can do it, too. Of course there have been intellectual and technological adaptations, particularly when you include throwing and shooting things so that the objects have been charged with a "created height" so that they will be dropped in the designated location. Cannons have been particular benefit to this aspect of advanced dropping. And then of course there are the "Galileos" of dropping--like Galileo--and Jonas Moore and David Letterman and of course Seinfeld's Kramer, and to a lesser extent there's also every other person from the Boston area who represent hundreds of millions of people who drop a letter from somewhere in their spoken vocabulary. There are people who drop their accents altogether, and of course politicians who drop the truth, and the tantalizers who drop suggestions, and paid-for pharmaceutical consultants who drop the untoward test results and their accountants who drop a zero when necessary. People drop options, they drop in and out and off, pennies and dimes, lawsuits and dumplings, coverage and names and the f-bomb. They also drop dead and bombs, the last two being closely related, though more people "drop dead" when bombed because they are killed. Bombs seem to be the biggest of all dropped things, especially bombs dropped by airplanes, and especially those bombs dropped on collections of people, which are called cities. This was a model of sorts for a critical-care-parachute-gurneystretcher, or something, for when a crew member of a U.S. Army Air Force aircraft was injured and needed care, though the article doesn't specify where the person would be dropped. Overall it seems not the height of workable ideas, and suffered no doubt from its model using a baby doll, which just looks altogether wrong. And the last part of this episode is another strange bit: dropping women on Manhattan. The image comes from 1904 and--when taken out of context--it seems as though Manhattan is in for the worst of it, with a view in front of the Flat Iron Building of an aerial bombardment of women. This is probably one of the few bad things that weren't done with/at women, and would actually significantly predate the first use of explosives being dropped from aircraft. Unfortunately the original, intended image was a poke at crinoline and featured women being blown up into the air rather than the other way around, though I like my interpretation better. By General Principles, with Exceptions. By Cause and Effect, By using Words contrary to well-known Principles, By Action conjoined with the use of Words, By Variations of Emphasis. By Exalting a Probability, By Circular Reasoning. By a Question involving a False Premiss. By reasoning upon that which may be known. By changing the Word for the same Thing. Re-setting Chapter XI seems to be more of a result of exploration in the more-densely arranged original--setting out in the book's version one is more like an explorer, finding bits and chunks here and there, and then simply placing them in a more orderly fashion, as in the case of Piranesi's bits and pieces. The text of Chapter XI might also be read as a street map, and the reader, in this case, could be attracted to it as a flaneur, roaming its twists and turns in a casual but observational way, strolling into the most interesting and attractive parts. An urban garden of words. "Colour is the keyboard, the eyes are the hammers, the soul is the piano with many strings. The artist is the hand which plays, touching one key or another, to cause vibrations in the soul"--W. Kandinsky, Concerning the Spiritual in Art, translated by Michael T. H. Sadler, 1912. I'm not sure exactly when the first published non-represntational/purely abstract book illustrations appear--perhaps it is with the Kandinsky book in 1912. Kandinsky is widely seen as being probably the first to produce art where there was "nothing" of the physical/representational world recognizable in the artwork--this around 1910/11. The trend was widely seen in the Impressionist movement of the 1860's/70's+ (and with James Whistler 30 and forty years earlier) though finding art like this in book form published contemporarily with the artwork itself is a fairly rare event. By later 1911 and through 1912 completely non-representational painting was seen in the work of many, including Gelizes, Delauny, Kupka, Dove, Picabia, and others. What I found particularly interesting in this image by Natalia Goncharova (1881-1962) was that not only was it a book/pamphlet illustration, but it was on the cover, as well. I know this must be very early for artwork such as this to be published in a book, but it strikes me as being very unusual that it is straight-away the first thing you see. In the History of Real Monsters the Kraken occupies an elevated spot--that's what made me sit up a bit while browsing an issue of The Medical Repository of Original Essays and Intelligence Relative to Physic, Surgery, Chemistry and Natural History... for 1813. The "natural history" part comes well down the title page, but lurking their in the back of this slim volume, after articles on spotted fever, and the winter epidemic of 1812-1813, and the varia of medical and surgical correspondence, came this article on the Sepia Octopus. This was a report sent in by the editor of the journal, Samuel Mitchill, on the sighting of the beast by a Captain Merry of the ship Niagra, sighting "A large lump" on the sea, and determining on closer inspection that it was a colossal polypus, 200'x30'. There are many other sightings told, and then Mitchill gets down finally to identifying these creatures as the legendary Kraken (naming Pliny as an original source). It is interesting that a reporting agency like Poor's Industry Service would have such a provocative cover illustration when reporting on the not-so-good economic news of 1932. Poor's presented the city of the future as the standard banner for their report on the motion picture industry. The city is massive, a portrait of concrete masses, especially seen in the dam or terminal in the immediate background, and also in the assembly of conical buildings at rear right. Very impressive, especially considering it was the fourth year of the Depression. Their report on the film industry was crisp and fairly bitter, carrying on about risky behavior and out-and-out mismanagement, leading most of the studios into loses and the industry in general to a plunge in composite net earnings and common dividends--a poor year. In any even I was interested in the illustration, which seems an unlikely place to find such a severely International Style vision of the future. This is what defeat looks like, or at least so it did in the Philippines in 1907, when the revolt against the Spanish and the Americans was finally at end, for the insurgents. On the one Faustino was a terrorist; on the other he was a patriot and holyman fighting for his country. He had fought the Spanish occupiers in the 1880’s until he was captured and imprisoned. After his release and following the American victory, he founded a religious/insurgent group—the Pulahans--whose ultimate religious experience was to defeat the invaders or die trying. (From where I sit it seems as the requisite belief was death in battle for this struggle rather than the actual victory which was the benefit to the followers.) The Pulahans for the most part eschewed firearms and other “modern” weapons, launching themselves into battle with bolos, knives, and little else, hoping for hand-to-hand fighting. It is reported that there were 10,000-15,000 of these troops, making them a formidable army, frightening if you were one of the soldiers that they were going to attack. These post-war Pulahan Wars lasted from 1902 to 1907, ending with their leader’s capture by Philippine Constabulary and the 8th U.S. Infantry.One of the few official reports on Faustino’s capture was recorded in a legal document regarding jurisprudence in the arrest of the others who were with him that day. In U.S. v. Espiridion Rota et al (found in the Supreme Court Reports of the Philippine Islands, volume IX, published in Manila in 1908), the unfortunate story of the application of law to the other five men is told, as is the mention of Faustino’s capture. It turns out that when the others were taken into custody and the wheels of justice began to turn, they all pleaded guilty, and charged with the crime of brigandage. Rota was sentenced to hanging and the others to imprisonment for 35 (+) years. Plus court costs. Their case was appealed because it was said the men had no idea what the guilty plea would get for them in the punishment phase; the Supreme Court upheld the conviction as well as the discipline, which was a little moot for Rota as he had already been hanged. What one might infer from this, I think, is that Faustino’s date with his punishment was probably met right there by the hut in which this photo was taken; that his destiny was sealed; and that rather than martyr a religious leader, the troops merely took the severely wounded (and beaten?) man into the woods and disappeared him. According to the historical sites which have used the other two photos of mine of this event (all done freely and without attribution, unfortunately), these are the only known photos of Faustino’s last times.